Hey y’all, how ya doin’?! Here’s Filipino recipe that I really love for its simplicity and deliciousness. Ginataang kalabasa means ginataan meaning “cooked in coconut milk” and kalabasa meaning “pumpkin”. 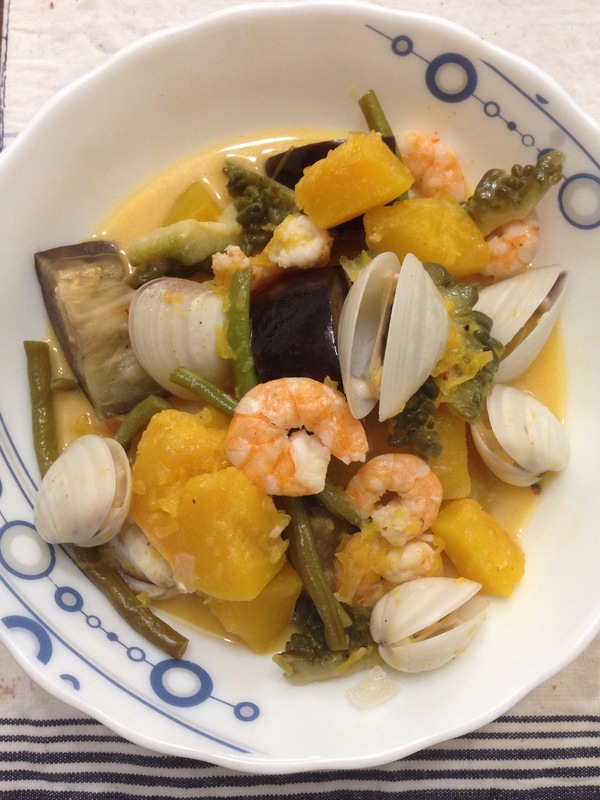 You can use any type of protein to accompany the veggies, I used clams and shrimps for this one. Sauté half of the garlic and onion with the clams first. After 5 mins, put the shrimps until half-cooked. Transfer into a plate and set aside. 3. In the same pot, sauté the remaining onion and garlic until it loses its color. Add the all the pumpkin. Reduce the heat and cover the pot. 4. Once the pumpkin is soft yet firm, add the coconut milk, pepper, fish sauce and the remaining vegetables. 5. Simmer until all the veggies are fully cooked. 6. Add the cooked clams and shrimps and simmer for another 5 minutes. Best eaten with steamed rice. Enjoy!